3 of a corrective "abc" or a failed wave 5 of an entire completed trend. 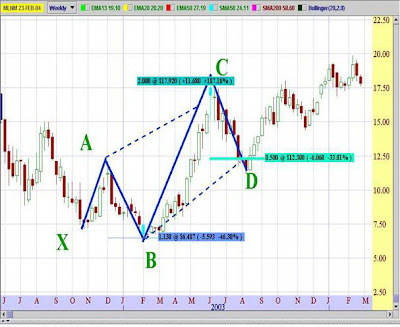 Although these are obvious similarities, from the Harmonic Trading perspective, it is important to examine the structure via its relative Fibonacci measurements to satisfy the pattern requirements. The 5-0 is an incredibly precise pattern that possesses only two numbers – the 50% retracement of the BC leg and the Reciprocal AB=CD. 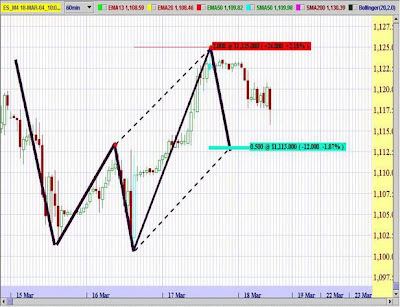 It is important to note that the measurements utilized to define the Potential Reversal Zone (PRZ) are different from all other harmonic patterns in two distinct ways. In most cases, the XA leg is the defining measurement of the pattern’s completion, while the BC projection is normally a complimentary number. But, the 5-0 pattern utilizes the 50% BC retracement as the defining limit in the set up. 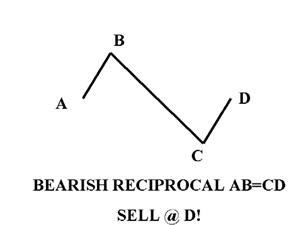 The Reciprocal AB=CDs within the specific 5-0 structure are quite effective in defining a precise area for a potential reversal. Although the 50% retracement is the most important number at the pattern completion point, it is still essential to examine the entire range. 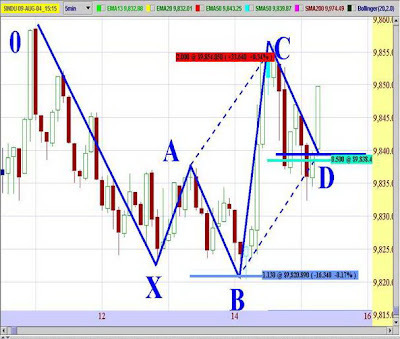 Although the pattern incorporates 5 points within the structure (X, A, B, C, D), the starting point of the structure (0) can be the beginning of any extended price move. However, the initial point X must possess a specific alignment with respect to the A and B point. The X, A , B formation of the structure is usually some type of impulse move. The XA projection that defines the B point can not exceed a 1.618. Any extension greater than a 1.618 will negate the structure, as smaller impulse moves are preferred. Again, this is the failed wave 3 or wave 5 – in Elliott Wave terms – that establishes the rest of the structure. After the BC leg has reversed from that zone, the 50% retracement is measured from the B point to the C point. In addition, the Reciprocal AB=CD is projected from the C point (an equivalent length of the AB leg) to compliment the Potential Reversal Zone (PRZ). The following illustrations and examples will clearly explain these concepts. 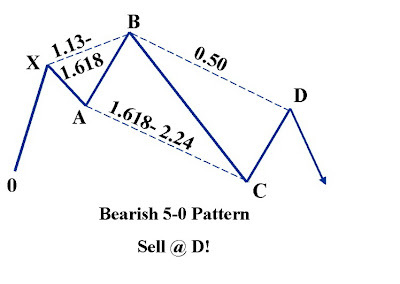 The Bullish 5-0 starts at the 0 point, representing an extended down leg to begin the pattern at X. The initial point X acts as the low of this prior substantial decline. After a quick reactive bounce to the A point, the structure abruptly continues the decline, only to find support slightly past the prior low at X. This is the failed wave 3 or wave 5 – in Elliot Wave terms – that establishes the rest of the structure. However, the important limits from the Harmonic Trading perspective requires that this X, A extension be at least a 1.13 but not greater than a 1.618. After the BC leg has reversed from that zone, the bullish 50% retracement is measured from the B point to the C point. In addition, the Reciprocal AB=CD is projected from the C point (an equivalent length of the AB leg) to compliment the Potential Reversal Zone (PRZ). It will take some time to begin to identify this structure but the obvious characteristic is the failed down wave followed by a precise 1.618-2.24 extension. At that point, it is important to calculate the 50% retracement level with the Reciprocal AB=CD and study the price action in the PRZ. This intra-day chart of the Dow Jones Industrial Average exemplifies an ideal 5-0 structure. After an extended decline from 9855, the index bounced (A) and then declined a bit further taking out the prior low (X) in an intra-day shake out to the 1.13 extension, before rallying in the mid-afternoon to the C point. After rolling over at the 2.0 extension, the 5-0 was set up with the 50% retracement at 9838 and the Reciprocal AB=CD at 9839. The index reversed sharply after exceeding this area slightly. 2.0 projection of the AB leg. The stock rolled over to retest the 50% level before resuming the up trend. The Reciprocal AB=CD complimented the 50% retracement just under the $12 level, defining a precise area between 11.50-12.30 to buy the stock. This chart of the ES was illustrated in advance. The structure was quite distinct and the 50% retracement was calculated at 1113. 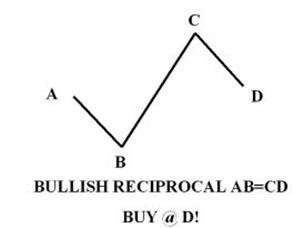 In addition, the Reciprocal Bullish AB=CD was projected to complete in the same exact area. The Bearish 5-0 starts at the 0 point, representing the low of an extended rally up to the initial point of the pattern at X. The initial point X sets up the failed break out area, where the rally from the A point to the B peak, nominally takes out the prior high at X. Again, this is the failed wave 3 or wave 5 – in Elliot Wave terms – that establishes the rest of the structure. AB length but it does not exceed 2.24. Again, this tight range of 1.618-2.24 is a defining element of the structure. If the 1.618 limit is not reached, the structure is not a valid 5-0. After the BC leg has reversed from that zone, the bearish 50% retracement is measured from the B point to the C point. In addition, the Bearish Reciprocal AB=CD is projected from the C point (an equivalent length of the AB leg) to compliment the Potential Reversal Zone (PRZ). This is a fantastic example of a Bearish 5-0 structure that possessed the ideal Fibonacci alignment to validate the pattern. 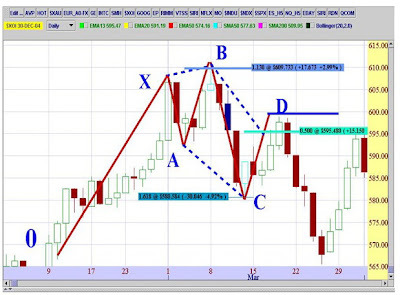 After a long rally, the index made an initial peak at the X point, pulled back to point A and reversed sharply at the B point, establishing the failed wave or triangle of the 5-0 structure.